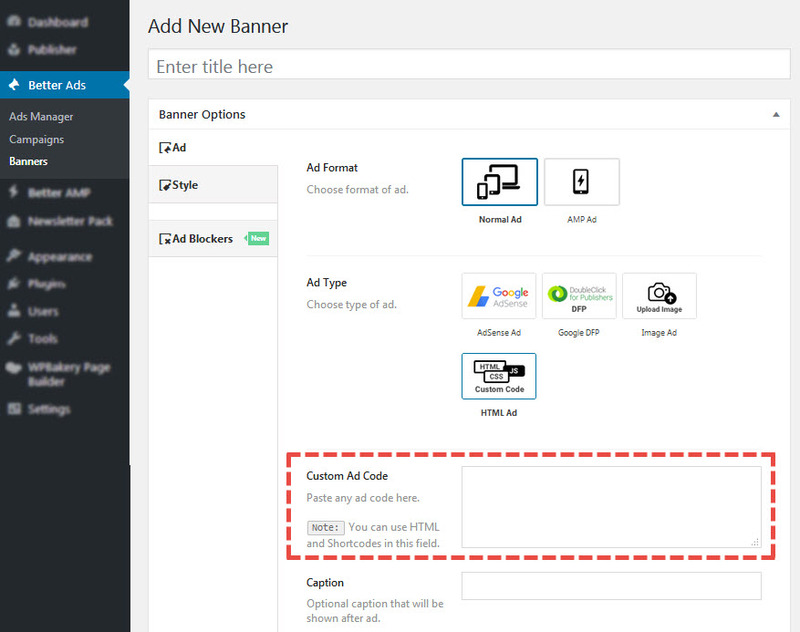 First of all, you should create a banner for your advertisement, then select a location for displaying it or add it to a campaign. For adding a new banner go to Better Ads → Banners, now click on Add New Banner at the top of the page. Now you see below page, we describe options one by one. Begin with Ad tab. 1- Ad Format: There are 2 type of ads. Keep in mind adding an Ad as AMP Ad, makes it just available for AMP Ad Locations. In the same way, adding an Ad as Normal Ad, makes it just available for Normal Ad Locations. 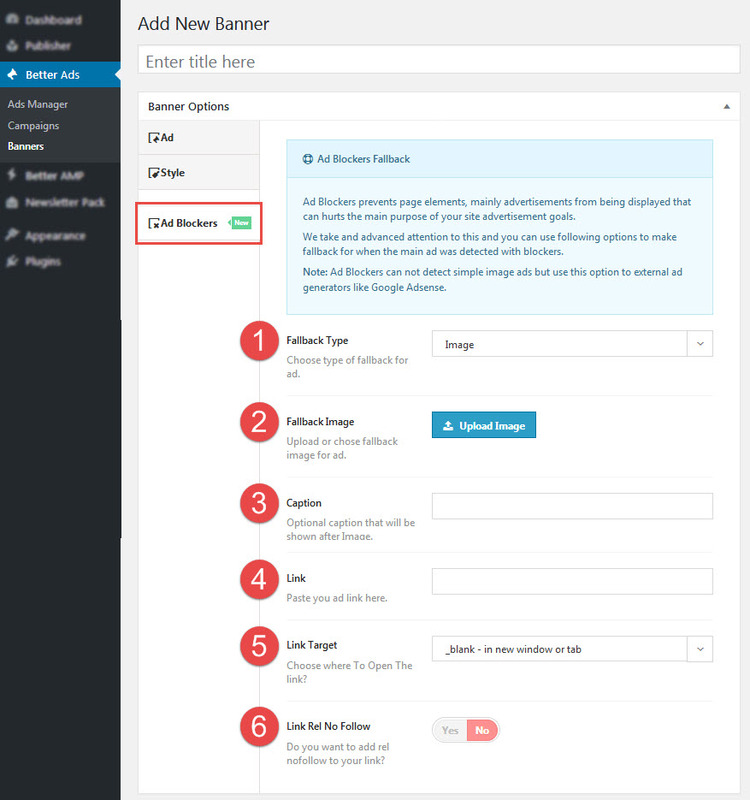 2- Ad Type: Four Ad types which have major use, are supported by Better Ads Manager Plugin (read Different Ad Types). 3- Caption: Optional caption for showing after ad. 4- Device: If you chose Normal Ad, you see a list of responsive fields that you can use them to show/hide Ad in different devices. Now let’s see what’s in next tab Style. 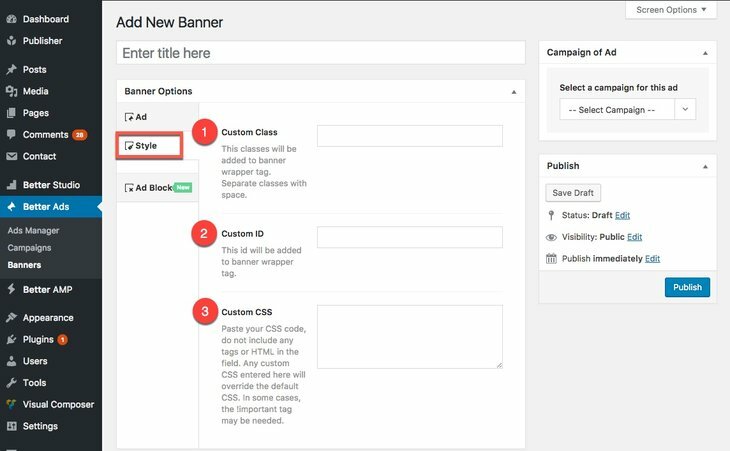 1- Custom Class: These classes will be added to banner wrapper tag. Separate classes with space. 2- Custom ID: This id will be added to banner wrapper tag. 3- Custom CSS: Paste your CSS code. Do not include any tags or HTML in this field. Any custom CSS entered here overrides the default CSS. In some cases, the !important tag may be needed. AMP (Accelerate Mobile Page) has tons of rules! (see ampproject documentation). Because of that, displaying Ad in AMP pages is not the same thing as displaying them in normal pages. You need to create completely different banner (also campaign) for displaying Ad in AMP view. You can use the same Ad codes for both normal and AMP pages but in different banners. Google Ads, most important Ad system we find on Internet nowadays. First create your adsense account (you need a Gmail for that), then grab your Google Adsense Codes from there and paste it in Google Adsense Code (see below image). It is another Google advertisement system (see DoubleClick for Publishers for more information) supported by Publisher. 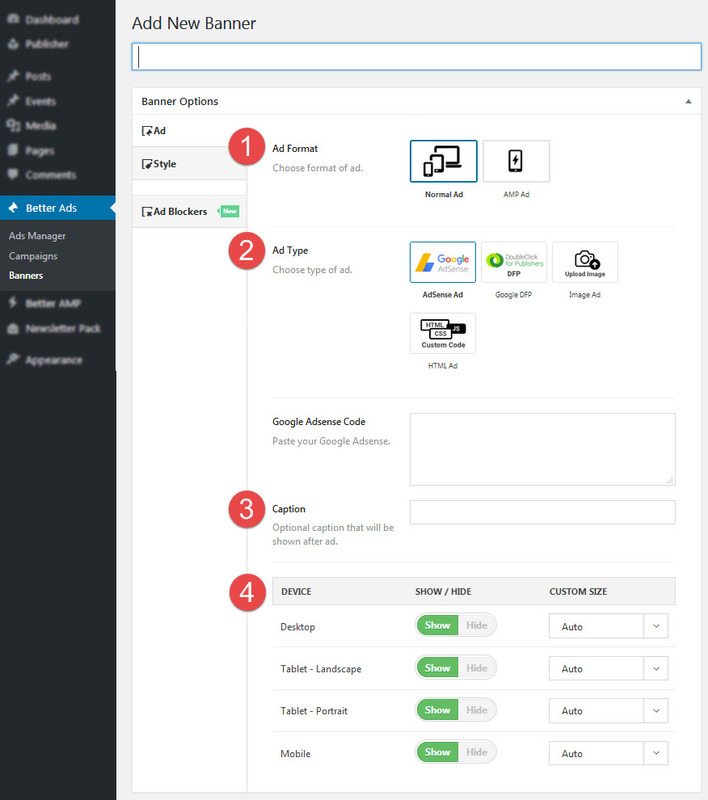 Like Google Adsense, create an account and grab Google DFP codes. There is a little difference here; for pasting this code you should go to Better Ads → Ads Manager → Google DFP, paste it in DFP Before </head> Code field. Now let’s get back to our Banner. 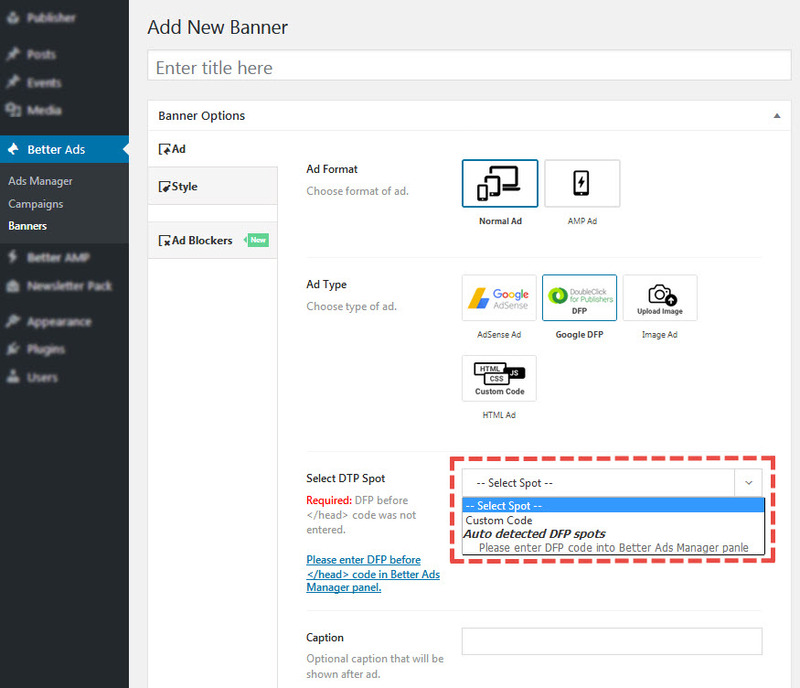 You see a drop-down menu, Select DFP Spot; DFP is not responsive so you need to select one size for displaying Ads. You can use custom codes for DFP or just autodetect and let’s Google decides about Ad size. Use an image (jpeg, gif, png, etc) for showing your Ad and link it to destination page. Image could be uploaded locally or link from URL. 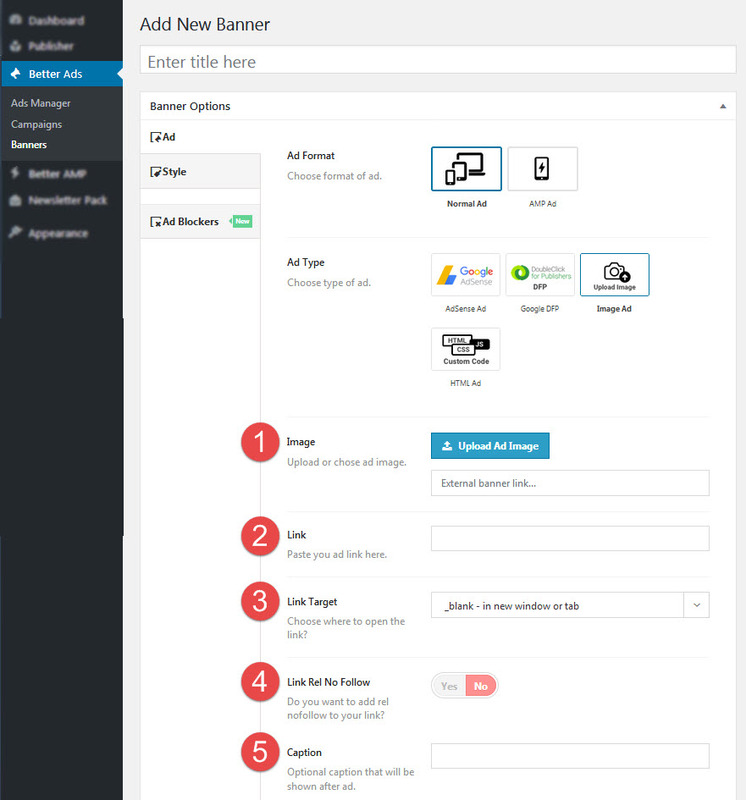 1- Image: Upload an image from your device or enter an URL link for it. 2- Link: Paste your destination page URL. 3- Link Target: Choose where to open the link. For example select _blank to open it in new tab or window. 4- Caption: Enter an optional caption for this Ad. This caption displays underneath the image. 5- Link Rel No Follow: You can add nofollow rel to this link. Ad Blockers feature make it possible to display Ads even on browsers with active Ad Blocker. First Better Ads tries to send normal Ad, if it fails, tries to send another Ad which should be appropriate in a way that Ad Blockers do not detect it as an Ad (however more sophisticated practice is sending an image which asks user to turn Ad Blocker off). 1- Fallback Type: Choose type of fallback for Ad. When Ad blocker detected on visitor browser, a fallback request will be received by website. 2- Custom HTML Code (not shown in the image): Paste your custom HTML code. Yo can add css code also within <style></style> tags. Remember don’t use your main Ad code here, because Ad Blocker had found and blocked it. 2- Fallback Image: Upload or choose fallback image for ad. 3- Caption: Optional caption for image. This caption displays beneath the image. 4- Link: Paste you Ad link here. 5- Link Target: Choose where to open the link. 6- Link Rel No Follow: Do you want to add rel nofollow to your link? then select Yes. Now you are familiar with all options. Most important parts are Ad Format & Ad Type, we described them in details. Ok well done! your Ad just need a name, enter it in the field at the top of page (image below) then click on Publish button. 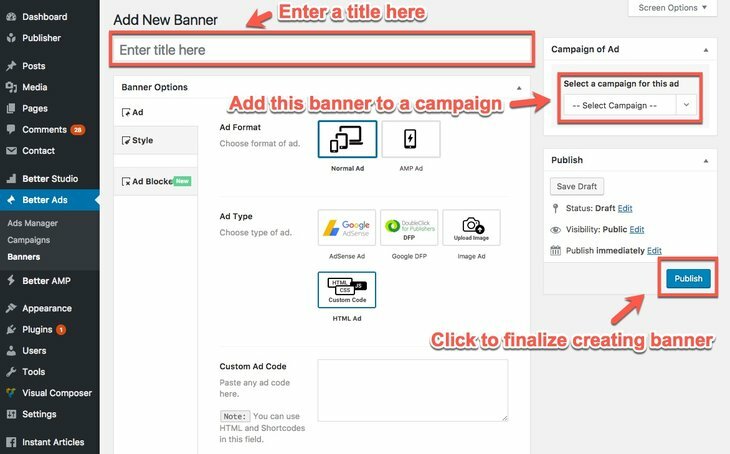 Your banner is ready for displaying, just one thing remains; if you want to use this Ad in a campaign, select the campaign here. For this purpose, you should create a campaign first. If you don’t have any campaign, don’t worry, build one then edit this banner and add it to the campaign.